Home › Forums › Practice & Advice › New here, need some advice. This topic contains 6 replies, has 4 voices, and was last updated by pdlw 1 year ago. Hello everybody, I am new here and glad to find a such wonderful website! Three years ago, I learned digital art for two month. I don't have any experience of any traditional art. 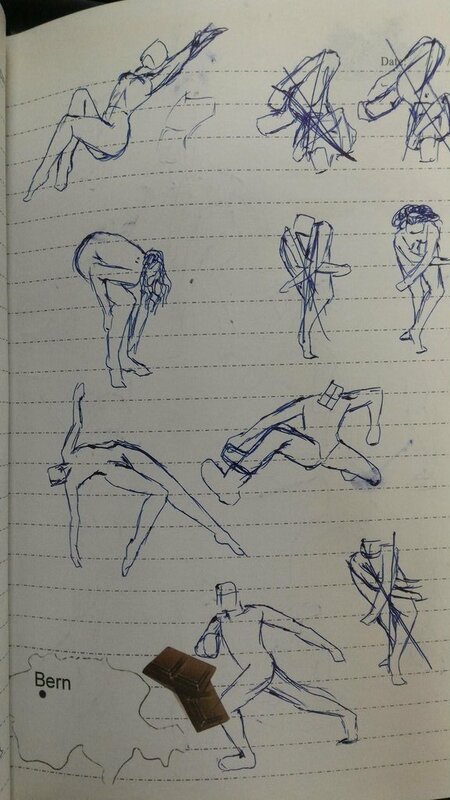 Recently I try to do some practice (10~20figures/day) before my manager enter the office everyday. I had try 45sec drawing but just find I can't do good job and feel very frustrated. I think my lines are strange and inflexible. I also find that I always can't draw some pose(which I made a cross on it). I don't know how to fix my problem, so would like to seek the advice and suggestion. Recommendation of youtube or book is welcome too! Hello! I'm not too great at figure drawing either but I have a couple things that I think could help. First off, there's a great couple of posts in the section of this site titled: "My daily gesture drawings." They've given great advice and there's a few different pictures of someone's own journey with figure drawings! They really analyze and try to understand the body and how it conveys character. They're also very inspirational (in my opinion)and it could help motivate you. Just overall, be patient with yourself. 45 seconds is good to get the bigger picture and overall movement down but it takes a bit more time to get all the nooks and crannies in. Also keep in mind that humans aren't lines, they're 3-D and tend to have more curves to them. Try using curvier lines while you're drawing and have fun with it. ^^ As was said in the "My daily gesture drawings" group, it'd be best to try a balance of short and long sessions. The short ones to get the overall picture and the longer ones to really analyze the body and pose. Just be patient with yourself, you will improve if you keep at it. Even if you don't feel like it. Hello!Thank you for the helping and recommendation! So the biggest thing I've discovered is that getting a figure right starts with understanding what's happening. To do that it's best to start with the simplest parts. What I'd suggest is to ignore the overall shape, and start focusing on the skeleton of the thing. Which I've tried to explain three times in words and it's just not working out so here's what I mean. Hope that works I've never done an image on this forum before. Anyway, what I find helps a lot, is to focus on just the overall skeleton. You'll notice(assuming the picture works) That I don't do anything that really fills in the figure until the longer posses. Another exercise, which I'm thinking of adding to my daily routine, is 15 second poses, in these all you really get to do is the curve of the spine and a line for each arm and leg. It really makes you focus on the vital bits of a pose instead of getting distracted by all the fleshy bits. I also second Wintersouls suggestion of varying the length of things. In my twenty minute sessions I like to do 10X30 second poses, 5X 1 min pose, and 5 x two minute poses. Anyway, hope this helps, if you want me to get more in-depth, or do a step by step of what it is I look at, I'd be more than willing. Oh one last thing, if you can get to a in person life drawing class, DO IT! Nothing gets one good at drawing figures like drawing real live people. It's also a great way to meet other artists. Hello kylinvandermeer, sorry for the late respond. Thank you for the suggestion and the example. I hear that some people do skeleton practice but don't know it's such an important things. I think I will take both skeleton and curve practice for several moth (or week) and try to do some longer work. I think trying to draw gesture under 45s is too hard for beginner. I'm a beginner myself, and have a hard time. It's okay to give yourself a bit more time maybe 2 mins first or 3, then reduce it once you get the hang of it. It takes me usually 30 min to 1 hour to even understand the pose if it's a hard one. So take all the time in the world you want, study and understand the pose, then once you get better, challenge yourself with shorter sketches. But don't forget to ignore the details! A problem I'm struggling with myself.